Pantera’s ‘Vulgar Display of Power’ Turns 20! Metal heads to this day still fight over which Pantera album rocked harder, is it 1990's Cowboys from Hell or 1992's Vulgar Display of Power? Both albums are an essential to any metal heads collection, however one of them has a birthday today! 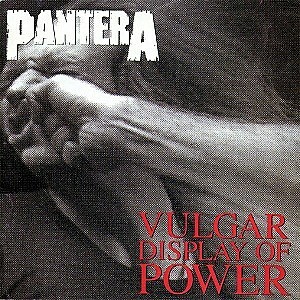 On this day (February 25) in 1992 Pantera's album 'Vulgar Display of Power' dropped! And in honor of this landmark metal album turning 20, there's been an exciting announcement that on May 15th a two-disc 20th anniversary edition of the album is going to be released. The news was shared through the bands facebook page where they also said the bands "lost" song 'Piss' is going to be on the album along with unreleased live footage from the 1992 Monsters of Rock concert in Italy. You can get all the info on the bonus album here! Even though in 2004 metal lost an incredible guitarist, Dimbag Darrell Abbott, the music he and Pantera created has stood the test of time! You can check out Loudwire.com's article on VDOP to get the full scoop, and they have a poll going on where you can vote for your favorite song off the album. My favorite song off VDOP is probably 'This Love' you can check out the video below! So let's raise a black tooth grin (Crown&Coke! Dime's signature drink) and rock out to some Pantera today!